The Twentieth Century Society was founded as the Thirties Society in 1979, and exists to safeguard the heritage of architecture and design in Britain from 1914 onwards. The Society’s prime objectives are conservation and education. Click on the links to find out more about the benefits of membership, our People or our Regional Groups. See below for more information about our history and aims, or to join online. Initially set up entirely by volunteers, the Society now has one full time and four part-time staff members based in London offices, as well as many volunteers. The Twentieth Century Society is governed by a Board of Trustees in accordance with C20 Governing Documents. Read more about our people or contact us. The 2019 AGM of the Twentieth Century Society will be held on Saturday 15 June 2019 at 11.30 am at Holy Apostles Church Hall, 47 Cumberland St, Pimlico, London SW1V 4LY. The Accounts and Annual Reports for the AGM will be available to be downloaded below for your perusal by the end of May. Hard copies will be available on request and at the meeting. If you have any questions for the Question Time panel discussion please send them, to arrive by 1 June, to coordinator@c20society.org.uk or by post to Operations Manager, The Twentieth Century Society, 70 Cowcross Society, London EC1M 6EJ. A programme of walks in the vicinity is being arranged. Elain Harwood will lead a tour of the of the Holy Apostles church immediately after the meeting. Alan Powers will lead a Chelsea walk, and Suzanne Waters will lead a walk to Churchill Gardens and the Lillington Estate. Further details and booking will be available soon on the event page. You do not have to book to attend the AGM. The Twentieth Century Society was founded as the Thirties Society in 1979 – the year the Thirties exhibition was shown at the Hayward Gallery. The need for a specialised conservation society covering the period after 1914 (the limit of the scope of the Victorian Society, founded twenty years earlier) was increasingly appreciated in the 1970s as understanding and awareness of twentieth century design was developing. 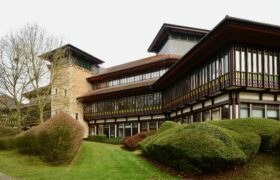 Some buildings dating from 1914-39 were already protected by having been recommended for listing by Nikolaus Pevsner in 1970, but these were almost all pioneers of the Modern Movement in England like the De La Warr Pavilion at Bexhill and the Lawn Road flats in North London. Other important works of the period – in different styles – remained unprotected, however, and the public had already been alarmed by casualties such as Oliver P.Bernard’s illuminated Art Deco entrance and foyer to the Strand Palace Hotel, removed in 1969 but rescued in pieces by the Victoria & Albert Museum. The immediate catalyst for establishing a new amenity society was perhaps surprising: the proposal to replace Sir Edwin Cooper’s monumental Classical building for Lloyds of London by a new structure (by (Lord) Richard Rogers). None of the other amenity bodies seemed particularly interested in the quality of the existing building, but Marcus Binney, the founder of SAVE Britain’s Heritage, John Harris, then director of the RIBA Drawings Collection, and the writer and journalist (Sir) Simon Jenkins felt that it represented a whole body of important architecture of the period that deserved more sympathetic assessment. They invited Bevis Hillier, the pioneer historian of Art Deco to become Chairman, and took the other key positions on the committee themselves when the society was launched at a party in the Park Lane Hotel in November 1979. Clive Aslet, then just beginning his career at Country Life, was the first Honorary Secretary, and Alan Powers became the first Caseworker around 1981. The name of the new society did not come easily. Eventually ‘The Thirties Society’ was chosen, since that decade was fashionable, but from the beginning, our mission was described as ‘to protect architecture and design after 1914’. The Thirties Society was therefore dedicated to promoting and protecting the best work of the 1920s and 1930s regardless of style; that is, not just Modern but Modernistic, Classical, Neo-Georgian, Pseudish, Gothic, and even Stockbrokers’ Tudor as well (to use some of Osbert Lancaster’s useful terms). And it was not long before post-1939 buildings at risk also presented themselves for consideration, the first such case being the National Union of Mineworkers Building in Euston Road, London in 1983. The society’s first serious case, however, concerned a prominent American-style Art Deco building, the Firestone Factory on the Great West Road in West London by Wallis Gilbert & Partners, which was demolished over a bank holiday weekend in August 1980 by its owners, Trafalgar House, in anticipation of it being listed. This outrage was to the Thirties Society as the destruction of the Euston Arch was to the Victorian Society two decades earlier; it focused public attention on the necessity for greater protection for 20 th century buildings and led directly to the listing of 150 examples of inter-war architecture (including Battersea Power Station) by the government. Subsequent campaigns by the society included that to prevent the wholesale destruction of the traditional red telephone kiosks designed by Sir Giles Gilbert Scott (1985-6), and one to preserve the extraordinary Surrealist interior and contents of Edward James’s Monkton House (1985-6). There was much public support for these campaigns, but official opinion took longer to shift. After a long battle, telephone boxes became eligible for listing, but sadly Monkton was not preserved as a house open to the public as we had hoped. Other campaigns included one to prevent the unnecessary mutilation of London’s best Underground stations and another to draw attention to that endangered species, the lido. By the later 1980s, many good examples of post-war architecture were beginning to be threatened. Knowledge of and scholarship on this period was limited, but the date limit of 1939 for listing was clearly illogical and the society pressed for the adoption of the ‘Thirty Year Rule’ for listing (which already operated in Scotland). This was, however, a time when modern architecture of the post-war years was widely perceived as an irredeemable failure in both human and structural terms, so that the enlargement of the scope of conservation was, as ever, considered a threat to progress, with the press eager to latch onto stories of a lunatic fringe trying to preserve concrete monstrosities. For this reason, it was perhaps fortunate that the test case was the preservation of Bracken House, the home of the Financial Times in the City of London, designed by Sir Albert Richardson, and one of the finest post-war classical buildings. The society’s chairman, Gavin Stamp, successfully campaigned for it to be listed in 1987 and in the end the government accepted the principle of post-war listing. A less than whole-hearted exercise in protecting a few token post-1939 buildings took place in 1988, and the process began again in 1991, under a more sympathetic minister. This time, key members of the Society were invited to work with English Heritage on selecting suitable candidates for listing, backed up by thematic research surveys of post-war architecture all over England. This collaboration was important in ensuring that the choice was pluralistic in its representation of many outstanding but little-known post-war traditional buildings. The chair of the English Heritage Post-War Listing Steering Group, Bridget Cherry, is a former vice-chair of the Twentieth Century Society. Among those recommended was Bankside Power Station, but for political reasons it was never listed, even though it was eventually selected as the site for Tate Modern, as a direct result of the Society drawing attention to its potential for conversion. With the emphasis of the society’s work no longer so exclusively pre-war, the society’s name – never wholly satisfactory – became increasingly misleading and in 1992 it was decided that we should be renamed The Twentieth Century Society. Membership by this time was around a thousand and income from our events programme, under the leadership of Robert Drake, was making a significant difference to our finances. We began to change from a completely voluntary organisation by employing Julian Holder as Caseworker (from 1991). We now have two caseworkers, or Conservation Advisers, a Co-ordinator and a Director. Alan Baxter & Associates invited us to join their group of tenants in Cowcross Street, Smithfield, where we have been able to use the Gallery for events such as our Spring and Autumn lecture series, conferences and members’ slide evenings. After publishing seven issues of the Thirties Society Journal, up to 1992, there was a hiatus before we launched a more substantial scholarly journal, Twentieth Century Architecture, in 1994, of which eleven issues have now been published, each on a specific theme. Other significant changes have followed. We were eventually put on the same basis as the other amenity societies in receiving support from English Heritage for our casework, commenting on an increasing number of statutory listed building applications. Prejudice and taste in architecture and design is fickle. In 1979, modernism was dominant, and the Thirties Society provided a counterbalance by its focus on other styles. Ten years later, the position was perhaps almost reversed, but by the end of the last century, the pendulum of architectural taste had swung back again. Nevertheless, under both our names and at all times, we have tried to create understanding of and appreciation of the best of all kinds of buildings erected in Britain in the 20th century. The Twentieth Century Society exists to safeguard the heritage of architecture and design in Britain from 1914 onwards. One of the Society’s prime objectives is education, with education comes appreciation. With conservation, another prime objective, comes the continued opportunity for extending our knowledge about those buildings or artefacts, whether important or humble, rare or commonplace as the red telephone kiosk, that characterise the Twentieth Century in Britain. As a result of our lobbying over the past twenty years, many buildings have already been saved. A notable success in 1993-4 was our campaign to persuade the National Trust to take on the Hampstead house of the Hungarian emigré architect Ernö Goldfinger, at 2 Willow Road, NW3, making it available for visitors. We hope other important modern houses will also be opened to the public in this manner in the course of time. The new Tate Gallery, housed in a spectacular Thameside building by Sir Giles Gilbert Scott at Bankside opened in 2000 and contains the Nation’s collection of modern works by non-British artists. In 1997 Swiss architects Herzog & de Meuron of Basle won the competition for the design of the new building, now being extended. Bankside Power Station, as it was known until decommissioning in 1970, is a powerful work by Scott, dominating the Southwark skyline. The Conservative government turned down our request for listing the building several times, despite the clear merits of the building. Finding this new use for it has saved it for the Nation.